In one month, Alberta’s biggest celebration of arts, heritage, diversity and community spirit returns. 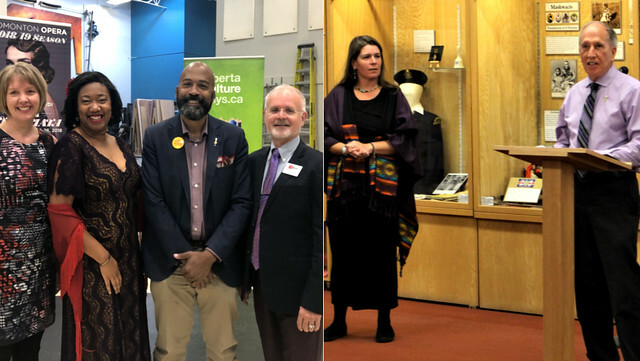 MLAs Shepherd (in Edmonton, left) and Hinkley (in Wetaskiwin, right) presented the Edmonton Opera Association and the Wetaskiwin & District Heritage Museum as designated Feature Celebration Sites for Alberta Culture Days 2018. Albertans will come together to celebrate Alberta Culture Days Sept. 28-30. Hundreds of free, family-friendly events will be held across the province, offering art workshops, historical exhibits, delicious food and so much more. In July, $200,000 in grant funding was announced to help community organizations plan and host Alberta Culture Days activities across the province. In total, 79 organizations have been named as official celebration hosts, including five Feature Celebration Sites that will each offer three full days of activities. "Alberta Culture Days is truly one of my favourite events of the year. It’s always wonderful to see the full spectrum of artistic traditions in this province come together and share a stage. I am so grateful that Edmonton Opera was chosen as a 2018 Feature Celebration Site and we look forward to offering Albertans a chance to experience not just opera but also a variety of art forms from around the world." “We are very excited that the Wetaskiwin & District Heritage Museum was chosen as a Feature Celebration Site. At the end of the day, we wanted to use Alberta Culture Days to acknowledge that a peace treaty was signed that lets us share this land. We want to celebrate Indigenous history, traditions and heritage and their legacy that allows all of us to come together and celebrate the rich diversity of our area"
Anyone can host an Alberta Culture Days event. It can be something as simple as a neighbourhood block party or opening the doors of an arts facility for behind-the-scenes tours, or as elaborate as a community concert. Planning ideas and customizable promotional tools can be found at albertaculturedays.ca. Alberta Culture Days is part of National Culture Days, a movement to raise the awareness, accessibility, participation and engagement of all Canadians in the artistic and cultural life of their communities. Organizations hosting an event are encouraged to post to the National Culture Days Calendar.